Immersed in the heart of the Sienese countryside, Siena Cottage is a lovely private villa with its own swimming pool and garden ideal for many day-trips in the central Tuscany. Freestanding villa with private pool and surrounding equipped garden. The villa is very spacious, comfortable and illuminated, composed of 3 bedrooms, 4 bathrooms wide living area and equipped kitchen. Extra beds upon request. The private swimming pool located right in front of the house is immersed in the large park, completely furnished for sunbathing and outdoor eating. The property is secluded, among the rolling hills of this territory immersed among art cities and UNESCO heritages, like Siena and Pienza. Only 900m away from the closest village with basic amenities and within a short drive from the closest facilities, the villa is a central base for many day-trips to Pienza, Montalcino, Montepulciano, Buonconvento, San Quirico d'Orcia all in a range of 30 km, not to mention Florence, Chianti and other famous attractions. 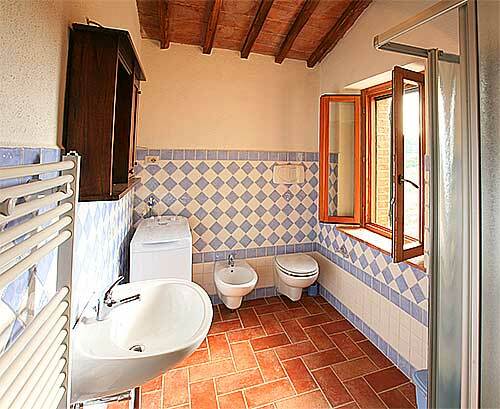 This stone built villa is a charming self-catering cottage immersed in the heart of Tuscany, among the soft golden hills in the vicinities of Siena. The area, called Val d'Orcia holds many wonderful towns including the Unesco heritage Pienza and breathtaking landscapes all around. The villa is set on a slope composed on two levels. The side entrance on the top level opens to the large kitchen, fully equipped with table, chairs, all modern equipments like refrigerator with freezer box, stainless steel sink, electric oven, stove, dishwasher. The kitchen is complete with all necessary cookware, tableware and utensils. The French door opens to a veranda furnished for outdoor meals, overlooking the pool area and the wonderful golden fields on the horizon. Besides the villa offers a wide private parking area. The front door gives access to the large living room with SAT-TV, tastefully furnished in classic Tuscan style, with the preserved features like the terracotta floors and original wooden ceilings. 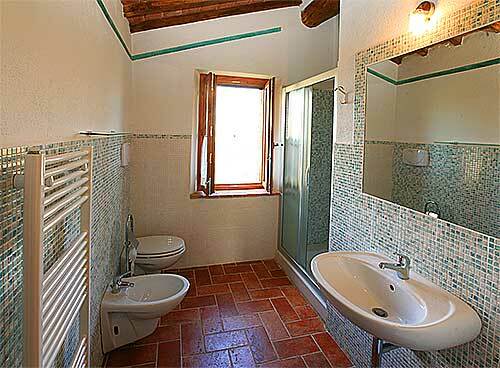 There is a fully equipped bathroom with shower, WC, sink and bidet on this floor, including also a washing machine. The separating internal door opens to the sleeping area which holds 2 bedrooms each with a private en-suite bathroom. 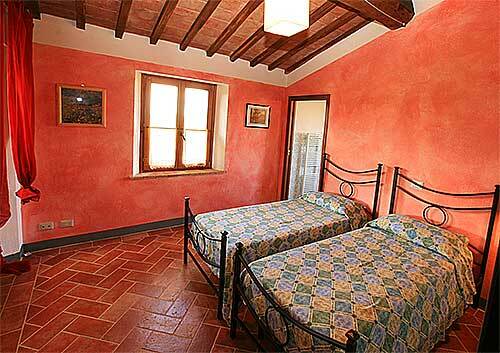 The rose bedroom has two twin beds made of handicraft wrought iron beds, a traditional craft of this region. This bedroom has its own en-suite bathroom, recently built with brand new equipments: shower cabin, WC, sink and bidet and beautifully decorated with local ceramic tiles. 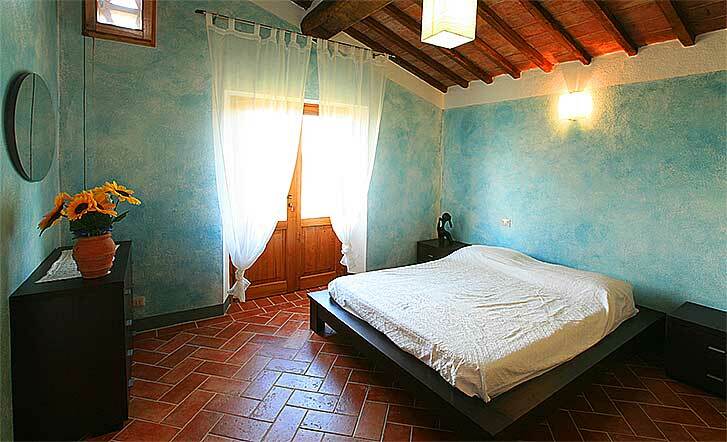 The blue bedroom is a wide and charming double, furnished with taste and a personal mix of modern and traditional style. 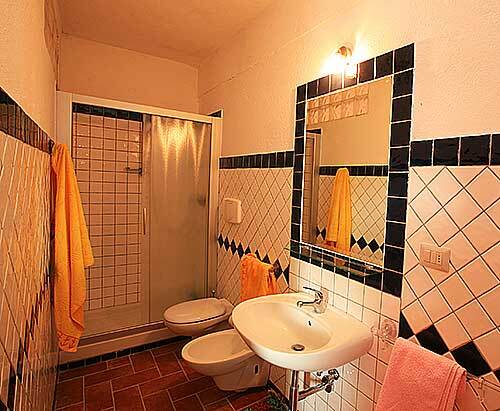 The double bedroom has its own en-suite bathroom fully equipped with shower cabin, WC, bidet and sink, decorated with ceramic mosaics. The stairway in the kitchen leads downstairs to the lower level, composed of a wide room with direct access from the back garden. This is an extra large double bedroom, with an anteroom that can hold Extra beds upon request. The lower floor bedroom has its own en-suite bathroom fully equipped with a brand new shower cabin, WC, sink and bidet. The villa is located in an unspoiled private property, totally secluded ideal for a quiet vacation yet not far from all facilities. The closest village, Montisi, is only 900m away, while San Giovanni d'Asso, with more amenities, stays only 7 km away. 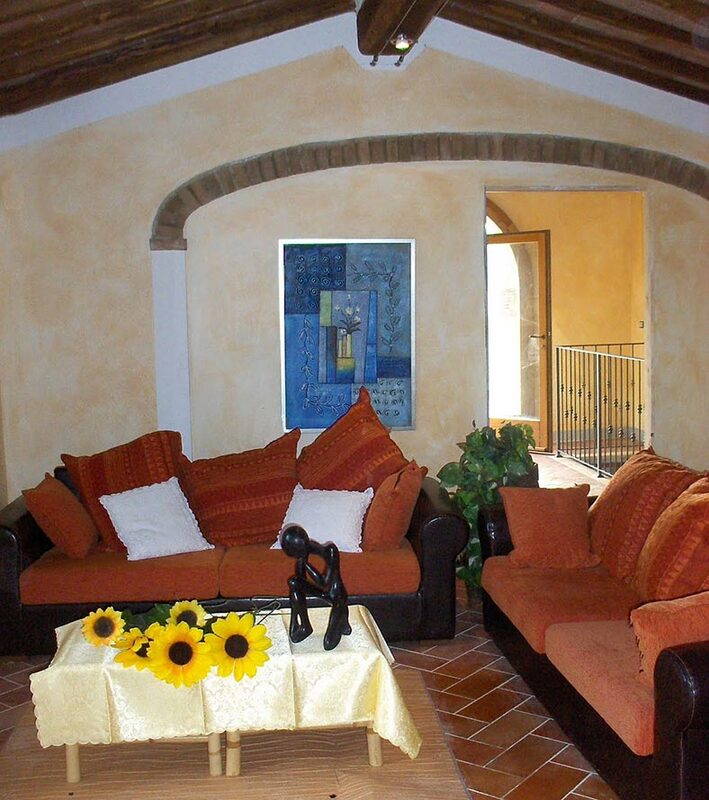 This is a great base in the central Tuscany for day-trips all around. 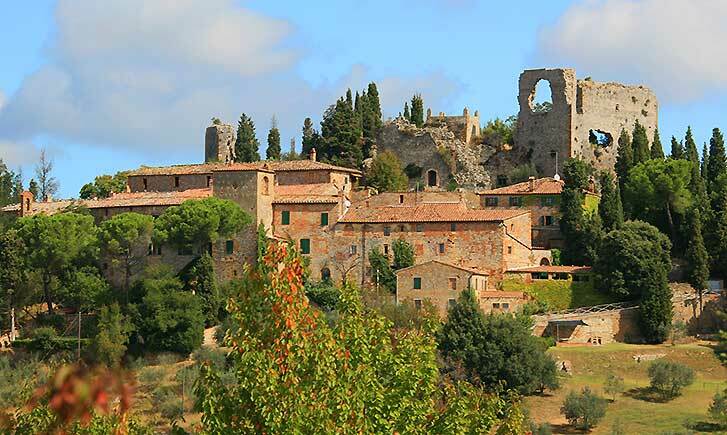 In a range of 30 minutes drive or less, you will find many medieval villages, Unesco heritages and two wine producing areas to discover: Montalcino, Montepulciano, Pienza, San Quirico d'Orcia, Buonconvento, Siena. In less than an hour you are in the heart of Chianti and one step from Florence. We stayed for two weeks at Siena Cottage and enjoyed every second of it. The villa is located in a beautiful scenery, has got a great view and is very quiet. The owner, Luigi, is very friendly and offers help whenever needed. In the villa you can find everything you need for daily life. The kitchen is well equipped and everything is very clean. The beds are also very comfortable. The garden and the pool are perfectly taken care of. Clean water, very comfortable sun beds etc. We can definitely recommend the villa and we hope to be back one day. We could not have been happier with our recent stay at Siena Cottage. It was a superb base for our stay in Tuscany. Organising the booking was easy through the website and dealing with the owner, whilst not overly proficient in English, was more than possible. He really made us feel welcome and took care of our needs. The property was modern, clean, private and exceptionally comfortable. It's location in Montisi was beautiful, overlooking the rolling hills. It was very easy to visit surrounding towns and found the quietness of Montisi very appealing. I was also very appreciative of the quick response from the agency in dealing with my booking. An initial inquiry was placed on a Saturday and a response came by Sunday morning. All in all a very positive experience. I would thoroughly recommend this cottage to others.